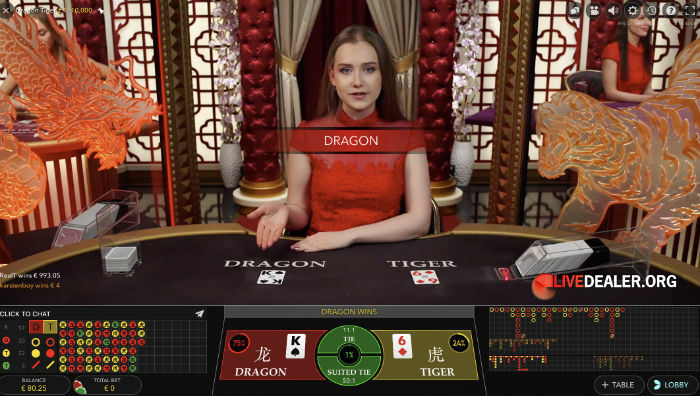 The latest live dealer table to be added to Evolution Gaming´s growing roster, Dragon Tiger, launched today. It´s a nice looking table to be sure with Dragons and Tigers that light up in the background to indicate which position won the hand, but this table has a couple of differences of substance from other live Dragon Tiger tables. Notably, the Tie bet pays 11:1, rather than the usual 8:1 (or 10:1 on Playtech´s Dragon Tiger table). Still not a bet you want to be taking…see returns below. It also offers a Suited Tie bet with a 50:1 payout. This is going to be a short explanation because Dragon Tiger is a very simple game. Here goes. Begin by betting Dragon, Tiger, or Tie (or Suited Tie). A single card is dealt to the Dragon and Tiger positions and the highest card wins, with cards valued in order from lowest to highest as follows: A,2,3,4,5,6,7,8,9,10,J,Q,K (ie Ace is low, J=11, Q=12, K=13). Winning Dragon or Tiger bets pay even money. 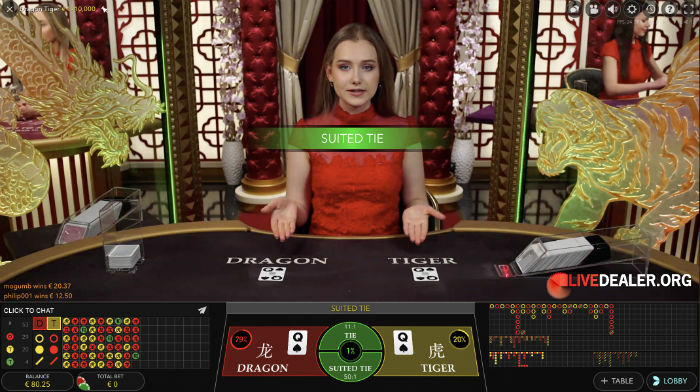 In the case of a Tie (same value card to Dragon and Tiger), half your Dragon or Tiger bet is returned, or if you bet Tie you win a payout of 11:1. In the case of identical cards (value and suit) being dealt to Dragon and Tiger, you win a payout of 50:1 if you took the Suited Tie bet. A maxim applying to most casino games is this: the simpler they are and/or the less skill involved in playing the game, the lower the return to player (of higher house edge). Dragon Tiger is no exception with a relatively low theoretical return to player rate for the main game (Dragon/Tiger bets) and horrendous returns for the Tie and Suited Tie bets. 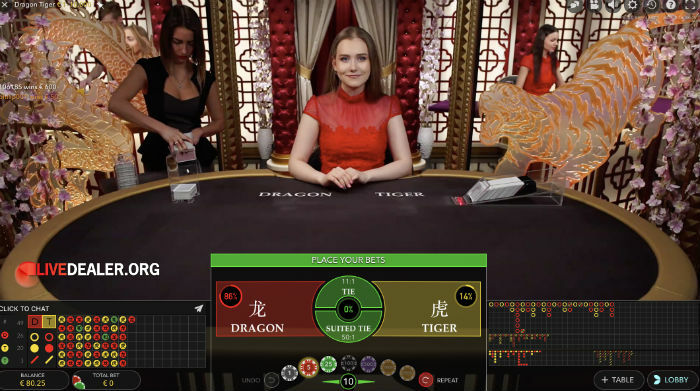 As has become customary of late, the first live casino to offer Evolution´s new Dragon Tiger table is Leo Vegas where it is now being streamed 24/7.